56. There's fish in the ocean! #56. There's fish in the ocean! This isn't going to be a particularly long entry, because it wasn't a particularly complicated scene. 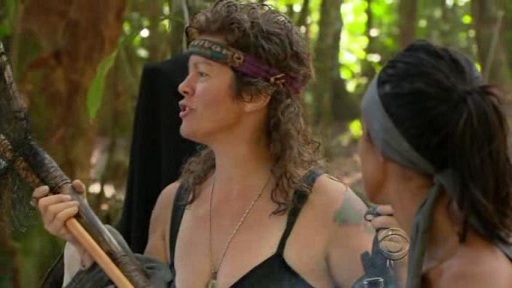 However... if you want to see one of my two favorite quotes from Survivor: Samoa (and one of the all time most underrated Survivor quotes ever), here you go. 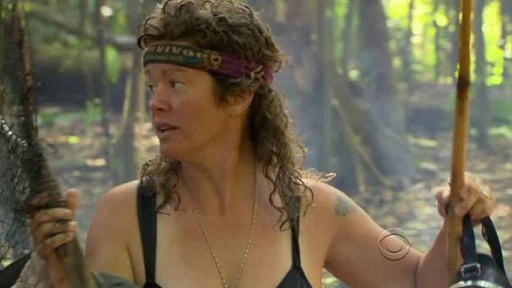 Laura takes a funny little quote about Shambo, and she makes it even funnier with the way she presents it. And who says she was always such a bitter little Betty all the time? Laura Morett manages to pull off the third highest Samoa entry on the Funny 115. 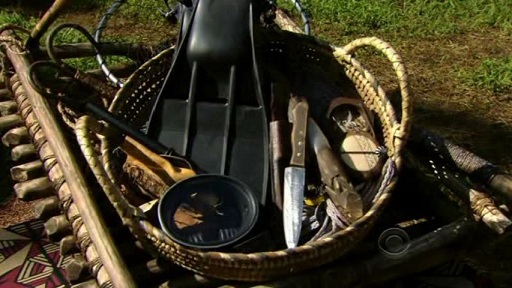 It is episode two of Survivor: Samoa, and the Galu tribe has just won a basket full of fishing gear in a big reward challenge. So the Galus take their gear back to camp. And since Shambo is the one who was the most excited to win it, she is the one who gets to take it out for the inaugural Galu fishing trip. Unfortunately, Shambo doesn't have much luck catching fish. The water is too murky, the fish are too quick, and she is kind of not very good at things. So rather than waste time looking for fish, she spends most of the afternoon just floating around on her back, enjoying the water. "I didn't catch any fish, but I tried." "There's no visibility in this pond water, so I can't use the mask and the spear." 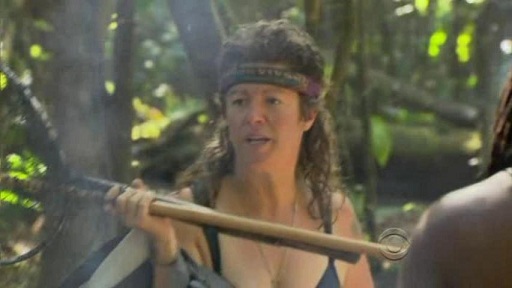 "So I'm gonna go Yogi Bear back float around here for a little while." A few hours later, Shambo returns to camp. She is sans fish but luckily she appears to still have her mullet. She also appears to still have her bikini, which praise Jesus and everything good and holy that He stands for. Shambo returns to camp, fishless. 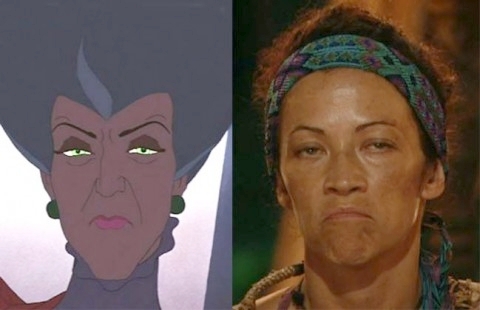 And now comes the setup for one of my favorite Samoa quotes. "You guys want the good news or the bad news?" "Bad news? I had no luck in the ocean." "Oh and the mouthpiece floated off. We don't have a mouthpiece anymore." Someone off camera asks, "And the good news?" "There are hundreds of thousands of fish on that reef." Ah yes. And there's the setup to the Laura quote. Why don't you please take it away from here, Miss Evil Stepmother? 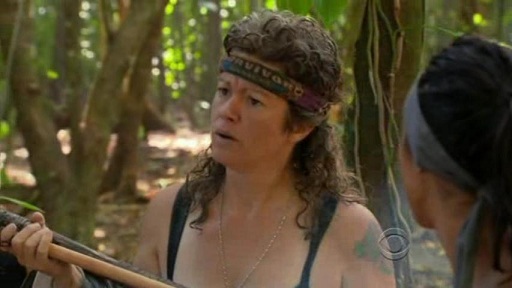 Laura (imitating Shambo): "The good news is... you'll never believe it." "There's fish in the ocean." Now unfortunately this is one of those quotes that I really can't do justice to just through a writeup. 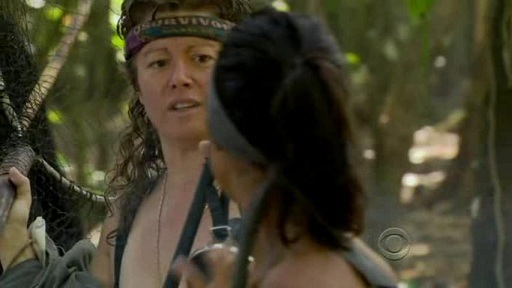 But luckily for you, I have it all in animated gif format so you can appreciate how cute Laura's little gasp laugh is. So here you go. Here is a clip I can watch over and over and over, and it will never get old. You'll never believe it... there's fish in the ocean! Yay! 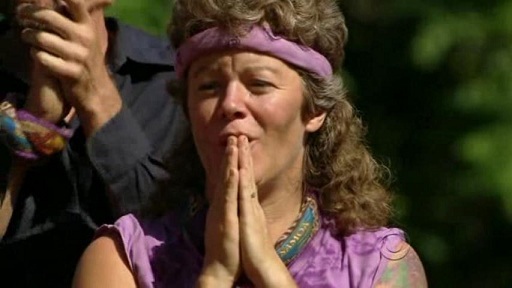 And as for Shambo? Well let's just say she isn't really a fan of Laura's either. "Laura just called me a whore."